One of the best things about owning a dog is always having a companion to go on adventures with. From playing in the snow to going for morning runs, there’s nothing your dog isn’t willing to join you for. Of course, not every adventure is a tidy one. Dogs have a way of finding the muddiest puddles to bound through, the biggest piles of snow to play in, and the dirtiest variety of things to happily roll in and alot of the time, you don’t want them bringing that that dirt, grime, and damp back into the house when you’re ready to go inside. But who wants to try and bundle a rambunctious, excited, and very dirty dog into the bathtub? That’s where a conveniently placed home dog wash station comes in handy. What is a Home Dog Wash Station? Dog washes are like rectangular shower stalls with a spray hose and nearby shelving that can allow you to clean off your boots, hands, and beloved family pet after returning from a messy adventure. They are most useful when built into a mudroom or, if you don’t have a mudroom, somewhere near your most used exterior door, whether that’s the front, back, or kitchen. By storing towels and dog shampoo nearby, you can quickly and easily wash and dry your pooch before they bound off onto your nice clean carpets and furniture. Your home dog wash station is also a convenient place to clean yourself, your kids, and any particularly muddy guests up and to wash dirty boots. Installing a dog wash is a lot like any other bath or shower installation so if you’re familiar with these, then this project should be a breeze. If not, you may want to work with a plumber to set up the water infrastructure and then do the tiling and external design yourself. What you’ll need first is a drain, basin, and hot/cold water connections for the shower hose. You might even be able to convert or make use of nearby utility sink. 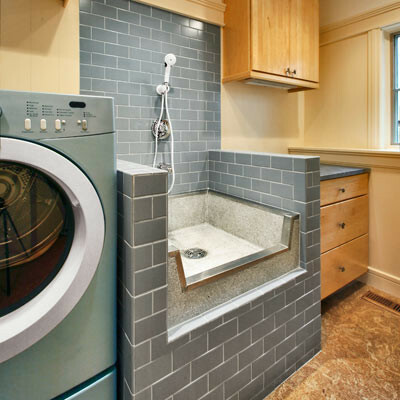 Once the plumbing is set up, you’re free to design any kind of dog wash that will fit comfortably in your mudroom, entryway, laundry room, or kitchen. Think about the size of your dog, the room you have to work with, and how convenient it will be to use. Many of the best home dog wash stations feature a wood or tile seat for owners to sit on, making it easier to lean over and wash your dog. You can even build the wash station a few feet higher with built-in or roll-out steps for smaller dogs if you’re handy with carpentry. When the design is complete, start building your infrastructure. You can either tile the base of the dog wash around the drain or use a plastic shower stall base instead. Tile should be applied at least three feet up from the base of the dog wash to protect the rest of the room and it’s advisable to build a wrap-around half-wall, possibly containing your bench, so that only one side of the dog wash is open and can get splashed. To handle splashes in that direction, you can install clear plastic half-doors, try a shower curtain, or simply place a sturdy bathmat beside the washing station to absorb splashes. After you’ve had a dog wash for even a few weeks, you’ll wonder how you ever did without it. Every time you come home with muddy shoes or a dirt-covered pooch, it will only take a few tidy minutes to spray everyone down, distribute fluffy towels, and proceed into your home clean enough for couch time. Even regularly scheduled doggy bath time will become a breeze as you finally have somewhere comfortable and convenient to sit.